To access various other settings for Tap Forms, click on the Tap Forms item in the menubar at the top of the screen, then click on the Preferences menu command. Reset dialogue warnings. If you suppress warnings on any of the dialogues you may want to see them again, so click this button. Ruler Units. This is for the units displayed in the ruler on the Layout Designer view. Backup & Restore. You can tell Tap Forms to backup when you quit the app and how many backups to maintain, The Show Files button will also show you the backup files on your drive. You can also provide a custom backup location. This is where you configure your Categories and Pick Lists. See the separate Categories and Pick Lists topics for more on these. 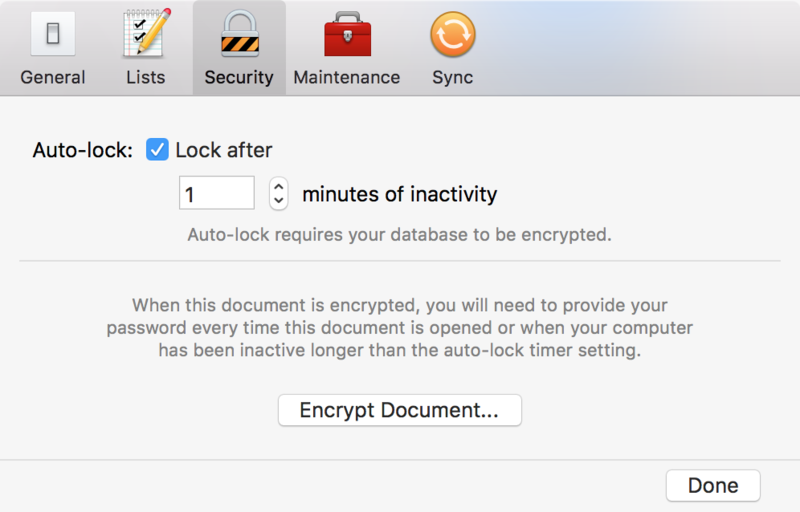 This is where you encrypt or decrypt the database, set the auto-lock option and set a lockout interval..
Auto Lock tells Tap Forms to lock Tap Forms if you haven’t used it after a set number of minutes that you can configure. To encrypt the database, click on the Encrypt Database button. If your database is already encrypted, you can decrypt it by clicking on the Decrypt Database button. *If you’ve forgotten your encryption key, launch the Keychain Access application on your Mac, search for Tap Forms, then double-click on the Tap Forms application password entry. Next, click on the Show password checkbox button. You’ll be asked to enter your computer’s password then you’ll see your encryption key displayed. The Keychain Access application can be found by typing Keychain Access into the Spotlight search field or by launching it from the Utilities folder (which is inside your Applications folder) in the Finder. !If you’ve forgotten your encryption key and you don’t see it in the Keychain Access application, there’s no way to recover your data. So make sure you never forget your encryption key or you have a copy of it stored in another secure location. Compact Database. When you add forms and records to Tap Forms, the database file size will increase. You would naturally think that if you deleted data, the size of the database file would decrease. However, that’s not the case. When you delete data, the space used is simply marked as available for new data. If you add a lot of data and then delete a lot of data, the file size can grow to be quite large. If you do that enough, the database file size will much larger than it needs to be. 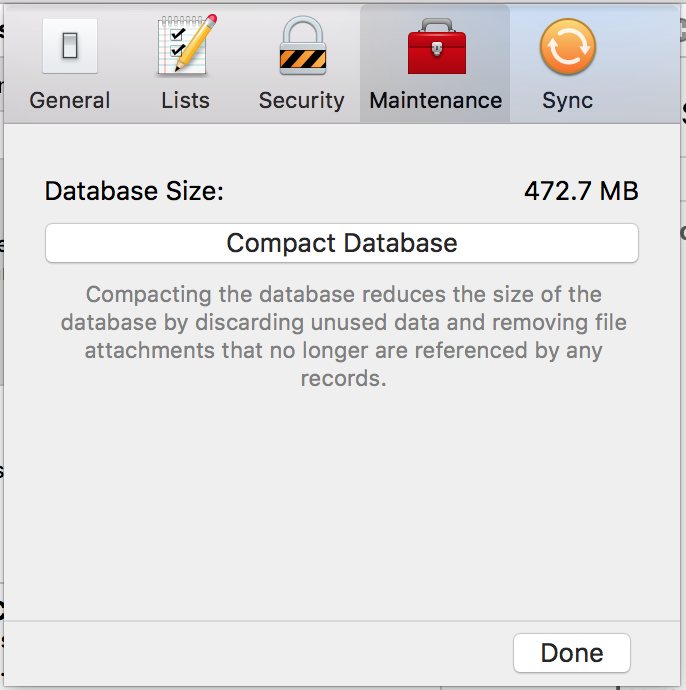 Compacting the database will compact it and give you a much smaller file. 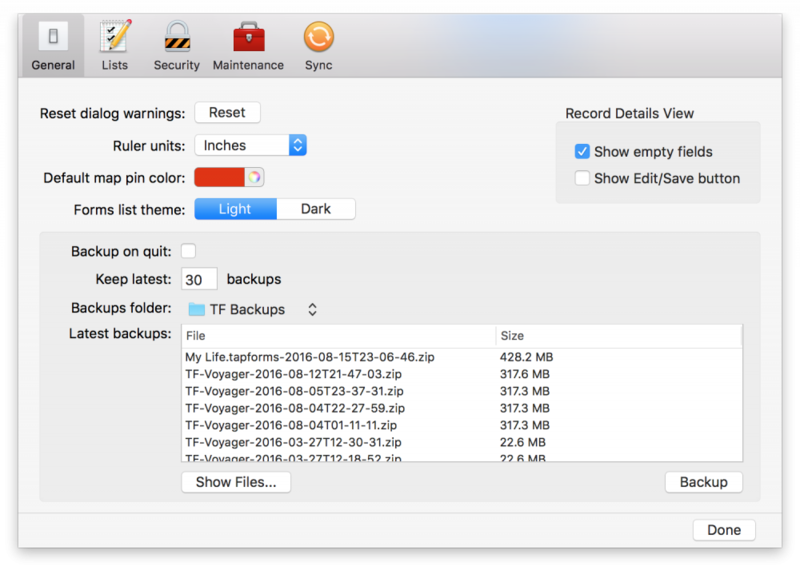 Smaller files also help to increase the performance.